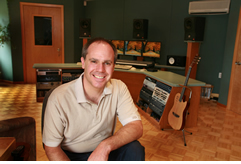 Blair Ashby (Denver, Colorado, United States) - Music producer and sound engineer. "I like that Pizzicato is so different from a midi sequencer that it makes me think different about music and my compositions. Thank you, I think Pizzicato will help me get to the next level. I finished composing three different CDs in December and realized I was bored with my musical style so I started looking for a program which would make me think different. I am glad I purchased yours. On Friday last week a small record label asked me for three songs and I am going to try to do the the foundation work in Pizzicato." 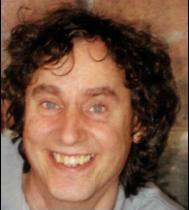 Philip Thomas (East Dummerston, VT, United States) - Lead music engraver Oxford University Press, New York Office, 1999-2005. Currently working as a freelance engraver for the finest classical music publishers in the U.S. and Europe. "I have used the Pizzicato program for a number of years now for its extensive composition environment which I find to be incredibly fast and intuitive to work in. My flute quartet "The Wissahickon at Dusk," which recently premiered on Maine Public Radio in the U.S., was created using Pizzicato. I enthusiastically and whole-heartedly recommend this brilliant program. And Dominique's great technical support too!" 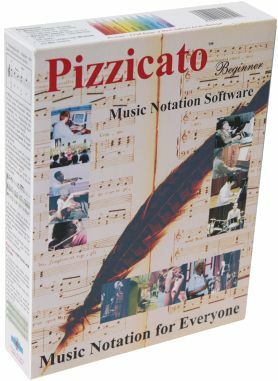 "Anyone looking for affordable music notation software will find that Pizzicato has powerful and comprehensive features. But what really sets Pizzicato apart is its vast array of compostion tools which are simple to use yet profound in scope and depth. Dominique Vandenneucker has designed a brilliant program which is sure to grow in stature and popularity as more users around the world spread the word about this remarkable software." "I use Pizzicato every day. 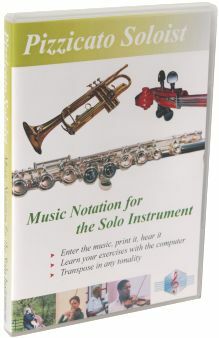 It is an excellent tool for all musicians from the amateur to the professional. It is mainly in the domains of sheet music publishing and creation of music files that I know this program, but I am always surprised by the power of the other tools offered to the user. Honestly I just could not do without it. And thank you to Dominique who always listens to his "Pizzicatists" so that the software is developed on the basis of the requests and interests of everyone." 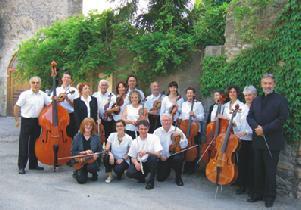 Our team tested your Pizzicato Professional under new Windows 7 operating system. You must know that your software passed by this test and we inform you that your software received the "Windows 7 Compatible" award. "I have been intending to write this letter for some time now to tell you how much I enjoy my beginner's version 3.3.1 of the Pizzicato program. I sing with a men's 4 part choir. Since I don't sight read music I surfed the internet to find a program that would allow me to type in the music that I was to sing, and play it back so that I could more easily learn my part. I really didn't think that I would find anything suitable. Then voila, your web site with demos of your wonderful program, showing what it would do and how that it does it. I have now typed in nearly all of my music and I easily learn my parts by listening to the tireless piano player that you have given me. 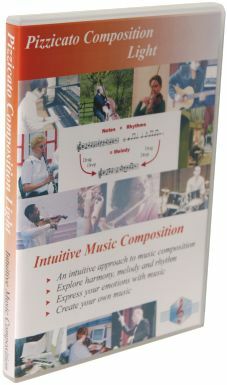 The versatility and ease of use of this program never ceases to amaze me and the fact that a manual and a complete music course accompanies it is just super. I am also, so pleased with the quick and accurate answers that you have given me to the very few questions that I needed to ask. I also enjoy the free newsletter. The choir, now has good copies of their music in all 4 parts and I have been able to make CD's to facilitate them in learning their parts. I just wanted you to know that your program has made learning to sing so much easier and more enjoyable for me and my choir mates. Thank you !" 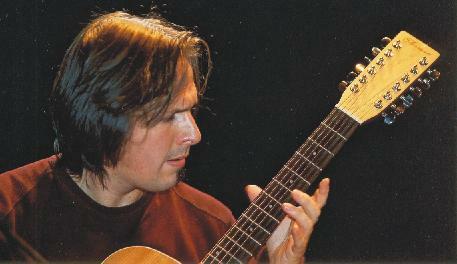 Alain Philibert (Saint-Jean-sur-Richelieu, Canada) - Author-composer, guitar and piano. "I am playing and composing music for years. I took piano lessons during 5 years between 11 and 16. When I was 18 years old I learnt guitar on my own. At this time I composed my first songs, music and lyrics. To conserve my music, I wrote songs on paper, lyrics and chords, and recorded them on tracks. 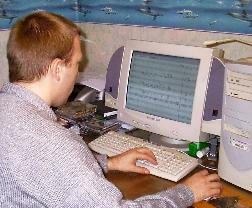 At the end of the nineties, I searched for a software which could help me to write my scores. The only ones I found were unaffordable. Then I discovered Pizzicato. At first use, I was dazzled ! And for this period, I have always appreciated improvements of the software." Zlatoje Pajcic (Germany) - Zlatoje Pajcic is a composer and publisher in Hamburg. "I was born in 1957 in Sombor (Yugoslavia), where I started my musical career studying harmony, counterpoint and composition with Prof. Milos Lalosevic, later studying the Tamburitza with Prof. Lazar Malagurski in Subotica, as well as playing clarinet in middle school. I have several TV-performances with Tamburitza orchestras I have organized, and in 1987 I had a 6 month engagement in Copenhagen. Since 1991 I have been a freelance musician living in Hamburg, and I am currently working on an extensive series of tutorial books for Tamburitza, played alone and in groups. I have so far completed 10 volumes. I am also writing arrangements and transcriptions for these instruments, and have founded "Tamburitza Publications" to publish sheet music for Tamburitza. 1. Scorewriter - These programs are for writing notes and publishing, but no generating of anything or processing of musical data. Some of them can recognize the chords. None have graphical editors. 2. Scorewriter -scorewriting, and composing-arranging features - These programs can have some intelligent functions like chord recognition, intelligent paste on simple basis, for example to "split voices". But we must duplicate the stave or other elements so many times or be so careful not to delete something that it is annoying. I think, Mr. Dominique Vandenneucker should warn the people who just purchased Pizzicato with the words "If you just purchased Pizzicato, don't forget to eat something and get some sleep in advance because you will not be able to leave it quickly!" 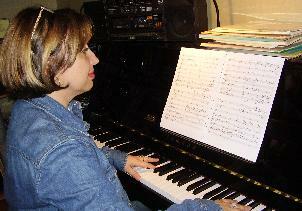 Mona Lei (Switzerland) - Composer, born in Bucarest (Rumania). Mona Lei has been living for more than 20 years in Geneva. She is a professional musician. In the eighties, she obtained the music teacher certificate (music theory, harmony, counterpoint, etc.) at the Music Conservatory of Bucarest. 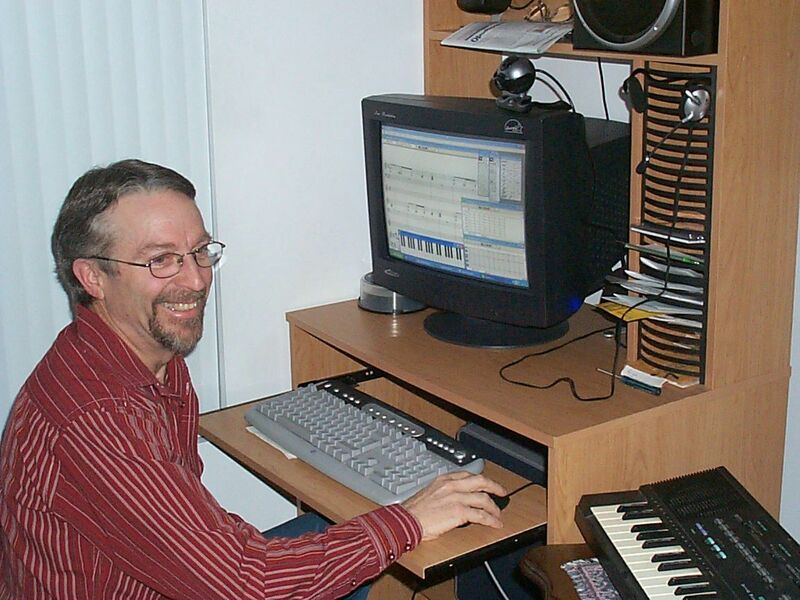 "While searching for a music notation software to transcribe the manuscript of one of my classical compositions, I was informed about the existence of the website www.arpegemusic.com, by a friend working in computers. For my first experimentations with Pizzicato I realized that it had a lot of qualities: fast access to music writing technique, practical aspect of this technique, easy to use and in the same time a real possibility to exploit musical richness. Really, what I immediately appreciated (compared to other softwares I used before) was the natural of Pizzicato. It was like using a paper music sheet, a pencil and an eraser. The big advantage is that the further I advance in my creation, the further I can modify the structure of my work, adding or erasing measures, staves, pages, instruments, etc. I have total freedom and I feel grateful to Pizzicato for that. 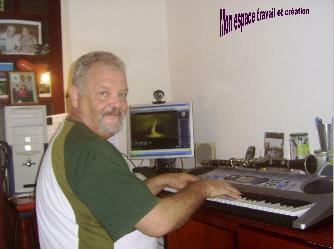 Now I work without keyboard, because I compose by playing piano. 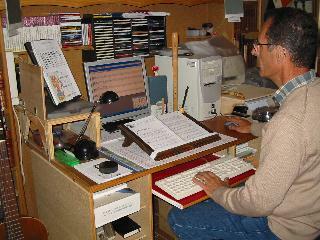 Then, I transcribe and listen to the result on the computer. Using this technique I recently wrote the cantate "To Jean-Sébastien" (18 minutes), a work which was interpreted in September 26th 2005 in Zürich under the aegis of UNICEF by the Terpsychords quartet, the OSR 1st oboist, Jerome Capeille, the pianist Anne Boëls and soloists of the Zürich Great Orchestra. P.S. : For those who still have difficulties to write triplets and other rhythmic sequences, I had some difficulties too, but after some days of practice, there was nothing to it." I have been intended to write this long time ago. I happen to get your web page through searching the internet looking for a kind of software that teaches easy music in general. During search in the internet I happen to find other software which I bought and tried it never came to my satisfaction. Later I found your Pizzicato software and decided to try with no hesitation, I grabbed your software. At the time I had no knowledge of music except the basics, always dreaming to write my own songs. Now I write my score or key it from my keyboard with the option you offered. Plus reading your guide lines and following your newsletters really help me a lot and the good thing is the software is affordability is amazing. Gradually, I have come to learn music and approach music from your music software starting from Light to Beginner and now Professional. The software is good and affordable plus the support is prompt. Thank you for all your help I really appreciate it. I want to write all the wonderful music I have collected from so many years ago when I took music lessons. Then I will save all this music to a disk. Last night I imported the rhythm for the song I am working on (BIAB) and then I dragged the instruments to the top of the BIAB rhythm in Pizzicato. Everything worked perfectly! Once again...thank you so much for all the help you have been giving me. Thank you for your swift response ! You have a great customer service. I enjoy your newsletter, which contains much useful information. I especially like your use of examples, which are very helpful. Even presentation on subjects which are very basic contain thoughts I find useful. Thanks for a great update. Thank you! I had been clicking on the note -- that must have been the problem. I appreciate your great service and patience! Thank you for your kind assistance. I wish more companies were as helpful as yours. Thank you for your quick answer. Quality after-sales service. Cheers. I wanted to thank you for your ability to react in support, you are really positive and efficient. I thank you for your counsels and your availability, patience and I appreciate your tenacity to help your custumers when they have technical problems. Thank you very much to remind me the basic user manual. I do not know why but I would absolutely want to find shapes in the symbols palette. Your advices are precious as always. I use Pizzicato Beginner 3.5 and I am satisfied by the product. Thank you very much for your precious help. I installed the Plugin on my other music software S. and it works. Thank you for your after-sales service. Thank to Pizzicato, I created music pieces and put them on a website which offer them to those who like instrumental music and most especially guitar. I would like to thank you. Pizzicato is helpful for pedagogy and the youngest pupils can use it is playful. And it is easy to comment. That I do with success ! The videos are well done. Thank you for the amazing update of Pizzicato Composition Professional ! I am a member of Helsinki Philharmonics (Corno Inglese / Oboe) in which I have been playing over 30 years. Many finnish composers have dedicated works for me. In the past I wrote them by hand, today with a computer. Your program seems an interesting option in this field of notation (music typing keyboard is fun and handy). I like Pizzicato, consider the complexity worth the flexibility in what I am able to do with it, and I'm mostly very pleased with the scores I've created with Pizzicato so far. Thank you again. You may remember that you gave me a lot of support after I purchased Pizzicato Solo. I was making a small book of well-known children's tunes for my recorder pupils. This is now finished and has been very successful. The children are practising every week and gave a very nice concert at Christmas. Thanks for all your help. I would like to thank you for the two latest updates: positioning the extent of crescendo/diminuendo and small graphic problem with trills and the related notes. What I like in your software is that it is constantly updated and evolving according to the tastes of users. I pass the whole hours to work with Pizzicato - this is rather nights that I should say because the concentration in silence is beneficial to the composition. We warmly thank you for your speed to answer and also for your sense of aid and the clear instruction. Congratulations for your software, I look forward the counterpoint version ! It's too great to create in polyphony with the personal touch of Pizzicato. Pizzicato is a well of informations. Thank you very much for your detailed answer. I could then install my MIDI keyboard easily and encode the notes quickly. I will be able to test the different versions of Pizzicato and know the one I will buy. I am enchanted by Pizzicato. Thank you for the care you take to constantly improve your wonderful program that gives me such pleasure. I take this opportunity to express my satisfaction (after 4 hours) on the usability of your software. I am a choir director and these products will make me move very quickly during rehearsals in part with the 4 registers.I just send to my voice choir respective midi file via email. Extraordinary! Also I take the original partition, I rewrite on Pizzicato with great ease and speed, I make a layout clearer and more visible. It's really wonderful. You made a great leap in improving Pizzicato: I know it takes time. 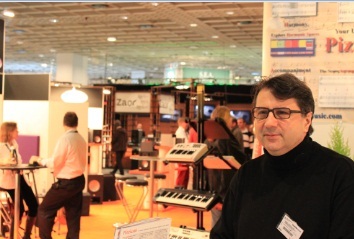 Laurent Calomne (Belgium) - Laurent is author-composer in all styles of instrumental music (especially new-age and film music) and French varieties. He is also a percussionist, clarinetist and saxophonist. "I intensively use Pizzicato to write my music scores but this software also helps me when I must for example transcribe an orchestral score written for 3 percussionists so that one musician can play it, or when I must transpose or even when I must extract parts from a conductor score. What is also interesting in Pizzicato, from my point of view, is that is is a belgian music notation software : it is rare and the technical support is effective, which is not necessarily the case with other existing programs where we often get no answer, no appropriate answer or answers that come too late. Briefly, 7 ideas can define Pizzicato: ergonomic, user-friendly, efficient, "tailored-made" (you can choose between a lot of versions), evolutive, democratic price and detailed user manual." N.B. : Music editors and other professionals may contact Laurent Calomne (laurent.calomne[at]skynet.be) or visit his website http://users.skynet.be/LC. "Ease of use and customized would be the key features of Pizzicato. 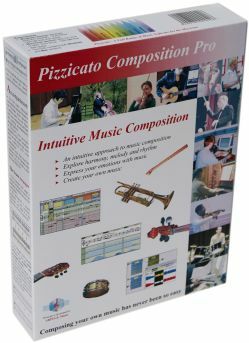 Indeed, I work with Pizzicato Professional since 1996, (release 1). I could participate with other users to the development of release 2. I could follow the evolution of the software but also influence the tool so that it can bring answers to all musicians working in various ways, music styles and areas. Working in jazz, chord notation is very important for me. But even in specialized harmony books, I sometimes do not find the chord notation I need or the scale I mean. Pizzicato helps me to easily and definitely create that notation and also to reproduce it in notes and in MIDI. Page setup tools and graphic tools also help to customize the software and make it your. All this with very intuitive tools which means fast execution. And when I speak about easy of use, my son (13 years old) - who practises music since he is 6 - use Pizzicato Professional 3 without consulting the manual and it is quite rare that he asks me questions. And when I hear what he writes, I think he is better than I am!!!". Alain Lumbroso (France) - Clarinetist. "Seventeen years ago, I created with my wife a classical chamber music association for amateur musicians: Chords-Music. 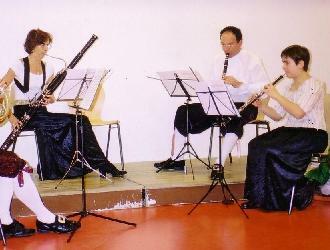 We give more than 10 concerts a year in Paris and in province. We use to play transciptions because sometimes the "original" musician misses to play a part and thus we replace his instrument by another one. So the Pizzicato music notation software combined to SharpEye2 is an essential tool for our activity." "Pizzicato is for me a source of wellbeing. At social level first, this software brought me an occupation in my life after I retired, a reason to get up from my chair and make my brain work, also an occasion to have more human contacts. Thanks to Pizzicato, I feel less isolated and more active. At the musical level, Pizzicato helps me to learn better, to read and write music easily. I work 2 hours a day with Pizzicato on my computer. At the beginning, I was using Pizzicato Beginner 2. Then I upgraded to Pizzicato Professional 2. Now I use Pizzicato Professional 3 and the SharpEye scanning software. The result? I encode music as a pro! I am transposing, reducing and helping our conductor to write his own arrangements on music sheets. I am also responsible of our musical library. Finally, I mention the great quality of the Pizzicato technical support. Mr Dominique Vandenneucker, designer of Pizzicato, always responded quickly to my e-mails, with kindness and patience. I never felt ridiculous. That is why I recommend Pizzicato to everyone." Michel Buffier (Limoges - France), trombone. 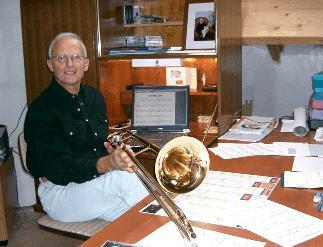 "I started to learn the tenor slide trombone as well as music theory. Equiped with Pizzicato Beginner 3, I think that software is a very complete tool for music composition. At the instrumental practise level, I appreciate that Pizzicato plays study scores for trombone. 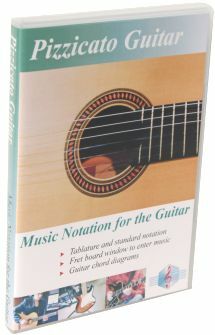 It helps me to memorize rhythms and melodies, which facilitates the instrumental play. I would make a similar comment for the theory: exercises about rhythms are better understood and memorized after listening to Pizzicato. I like to write beautiful scores with Pizzicato, clear scores that I can print. I found a blooming in music and Pizzicato increased it." "The Civrieux choir was created in 1979. Then it became "Musica", located in Saint André de Corcy. It is under my direction since 1996. 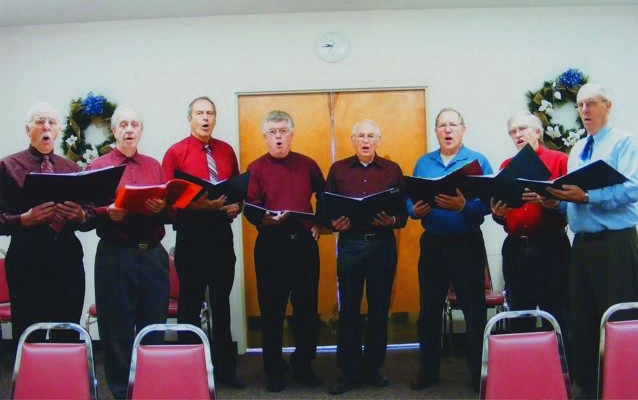 My chorists love to sing "a capella", but also like to meet every week. My main interest in Pizzicato is to elaborate polyphonic music scores for my choir and now it is great because I actually master the software!" Marc Figus (France) - Clarinet, recorder, guitar. "I am living in Moval in France. I play clarinet, recorder and guitar. I sing in a choir as a bass and I help our conductor directing classical pieces. Music is my main entertainment and I spend at least one hour and a half a day. Pizzicato helps me to transcribe pieces I learn for the choir or for the recorder (which I practise for a very long time) and so to understand the melodies and rhythms directly, avoiding errors difficult to get rid of later. Beginning with music composition, I can compensate my lacks with Pizzicato and that is why I recommend it to every music beginner." 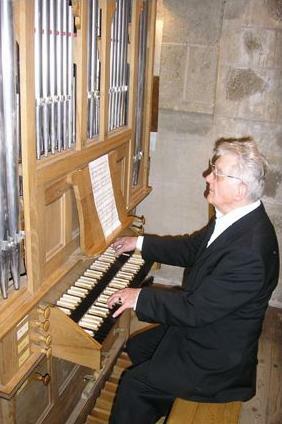 Jean-Paul Claude (Mons, Belgium) - Organist certificate at the Royal Conservatory of Mons in 1979, titular organist in Boussu, chorist and choir conductor, occasionally piano tuner. "My employment is to compose music for liturgy. 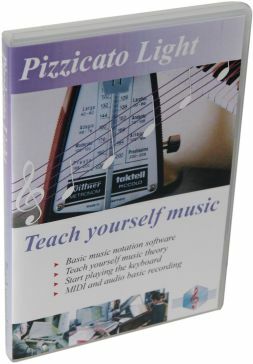 Musician for a long time, when I began to use a computer in 2003, I directly needed Pizzicato Professional. I thus appreciated the very complete Pizzicato manual, including the lessons about computer basics. For me it was a real advantage. I see two other advantages: the price of Pizzicato is reasonable (in comparison with other products) and the technical support by e-mail is very quick and performing and often helped me." 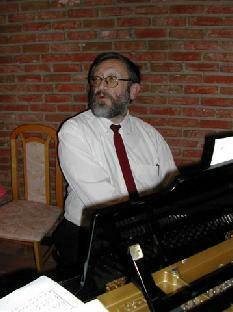 Jean-Claude Duteil (Guadalupe) - Pianist, clarinetist and saxophonist. 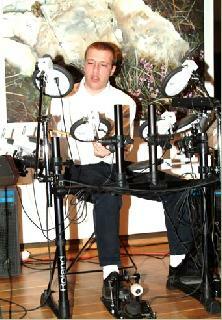 "Pizzicato helps me to play in solo while adding chords and other arrangements to my live music. 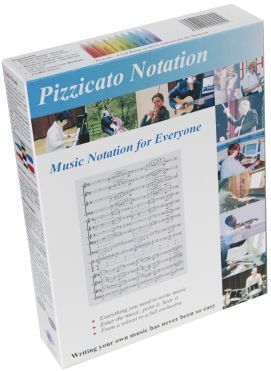 The Pizzicato music notation software is in my opinion the best music editor and score maker. Indeed it is powerful and user-friendly, so it is a pleasant tool as well for professionals as for beginners. Even if you only know a few music theory, Pizzicato guides you and holds you "by the hand" when you create your own music or arrange known scores. The user help is quite simple and shows you a lot of examples. For me, Pizzicato is more than a tool, it is also a "streak of eccentricity" in my life, because it helps me to express myself fully when I need it. My friends are astonished by my compositions, plenty of them want to copy them and some even want to buy them... I bought Pizzicato 2 months ago and my retired life is now more pleasant. A last thing : the online customer help is perfect and quick: you often receive an answer the same day and the conceptor really listens to you to develop the software." Jean-Claude Mariotte (Alignan-du-Vent, France) - Second violin. "At the age of 67, I became second violin in an amateur orchestra, even if I had dropped violin during more than 40 years. The first day, I could only play some measures and thought that I would never go further. But Pizzicato encouraged me to continue, helped me to understand that I could continue. Now, with this software, I am encoding the scores that I must play (it is easy with a little habit) and I record the music result on CD-rom (while beginning with a very slow tempo, than faster and faster, until I reach the tempo asked by the conductor). Like that I can work my scores at home, playing while listening to the CD-rom. I made amazing progresses and love now repetitions and concerts." Urs Steiger (Prilly, Switzerland) - Slide trombone. "Pizzicato became my necessary companion for my musical work. I am playing slide trombone in some amateur bands. The scores we receive are often of poor quality, then I switch on my computer and I transcribe them for myself and for other musicians who appreciate their quality." 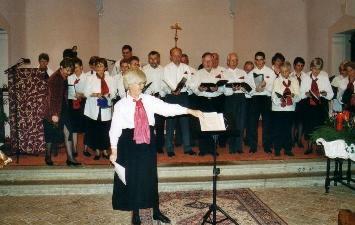 "I sing in the "Luy Choir", a choir of 50 persons which was created in 1998. I do not know music theory, so Pizzicato helps me transcribe scores to learn the different pieces of our repertoire. It also permits me to create more legible scores." Bruno Heureux (Hannut, Belgium) - Author-composer-performer. "Pizzicato presents a lot of interests to me. For example, with that software I can write the music and the lyrics of my songs. And the MIDI aspects that I am now discovering assure me that I still can discover many aspects of this concise, simple, professional and user-friendly software." "I conduct the "Choir of the Singing Thursdays", composed mainly of retired persons (we are about 50). I choosed Pizzicato to neatly transcribe old or difficult to read scores, so as to better study them during rehearsals. Congratulations also for the precious technical support. Your reaction is fast and we never feel alone." "Pizzicato is a pleasant software, of easy and powerful use… The tools palettes are well designed and the tools are not locked and I can duplicate them, move and even modify tools. The handbook is very clear and precise. And the program designer improves it. I use Pizzicato within the framework of my orchestrations for the symphony orchestra of Ste-Cecile in Nemours (France) where I am an assistant chief and the orchestra Ensemble Tuning fork in Villemandeur where I am the musical director. I think that Pizzicato is what is the best: it is a wonder." 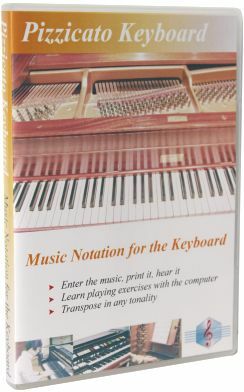 "I am a 61 year old beginning piano student in the U.S. and I received my first copy of your beginner software yesterday. I am delighted to have found your software. My teacher has encouraged me to write some music and to arrange songs that I like in a much simpler form so that I can play at my level. Your software is perfect for me. I am only using the shareware version now, but from your website I know that as I get more proficient at your software and my music, I will be able to continue to buy and use your more sophisticated versions of software. That is very encouraging to me, as are your continued advances in vectorial music composition. I would like to think that we will advance together, each of us getting more proficient and better able to communicate in music. I wanted to take this opportunity to thank you for your work and dedication to your software. I'm sure there are many more than me whose lives are enriched by you." I enjoy your newsletter, which contains much useful information. I especially like your use of examples, which are very helpful. Even presentation on subjects which are very basic contain thoughts I find useful. Please keep up the good work. 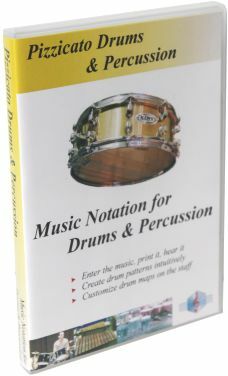 Many thanks for your many instructional notes on rudiments of music; these are very helpful and inspirational to me. I have no intensions of unsubscribing from your site. "I can now email music direct to the friends I play music with. I really love Pizzicato. Good luck to you and the programme." "Thanks for all your help...and you never lost your cool !" "I am very pleased with the way Pizzicato has been structured. I was mainly looking to refresh all the music fundamentals, esp Western music. It is done." "My daughter and I had a great time composing a song. I love this program." I am evaluating Pizzicato as an alternative to F. N. software. N. is a simple note entry tool without any interesting features while Pizzicato is a product of people who like to test new ideas and features. I am a complete amateur composing short songs with a few instruments in the background. I am not able to invest very much in software. I have more time than money. I am working on a Mac computer. Some of the ideas in Pizzicato are very interesting and I try to spend as much time as possible evaluating the different features. "I just wanted to write you guys a note and say thank you for this briliant software. I sing in our local church choir, and not being able to read music notes is a bit of a problem for me. Until now, that is. You have no idea how good it feels to come home from practice with the new notes, just type them in and play ! Bingo! It a huge relief, because we only practice twice a week and the guy sitting next to me can't really carry a tune (he just sings hum-hum-hum) and so I have to rely on myself and I haven't really felt confident about it. Now I have that confidence and I feel like I'm on top on the world ! I'm thinking about upgrading, but for now I'm happy with my version ! I want to thank you from the bottom of my heart ! Music is a language, and until now Ihave only been able to speak it. Your program has helped me to learn how to write and read it ! I still have a long way to go though but, it's getting better and better. I downloaded another music program, but it was just too complicated for me. Pizzicato is so easy, it's like "music for dummies" but it still has all the functions you need for more complicated work. I decide how easy or hard it is !" "I've been through many tutorials before—but for my point of view this has got to be one of the best-written ones I've ever seen ! It explains everything in an easy to understand step-by-step description-- and I love the examples. There is enough repetition that you really master the concepts, and yet it moves quickly." "If you believe this much in your program, then the least I can do is to use it !" It is necessary to learn to master a software like Pizzicato and I do not handle it completely by now but I adopted it. Definitely. The method is clear, but it is necessary to read courses again and then we memorize it without thinking about memorization. I am sure that with the program I will succdess in composing a melody with chords and rhytmic. I think you did a great job. "I am 88 years old. I took my first steps in music 2 years ago. I learnt at this time musical theory in the local brass band. Now I learn there trumpet and xylophone. A visual handicap makes score reading difficult to me and I also have deafness problems. I teached during 70 years. It gives weight to my first note: I never met a creation and training tool at the level of Pizzicato. It is only an image (because we are not horses! ), but certain horse-breakers control and educate easily the most restive horses. Their action is based on the respect of the codes used by the horses between them. Gestures so discrete that the ordinary observer does not see them..
Case of the deaf persons: as they perceive the vibrations with an extreme smoothness, they will use effectively and with pleasure all the possibilities of Pizzicato. 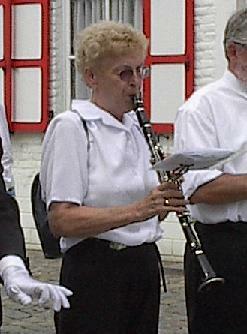 In October, with Pizzicato I will be able to take part in the repetitions of the brass band. An insane happiness of child! Thank you for the share that I owe you. You created a wonderful too to help self taught musicians and composers as I am. The paper user manual is helpful, well written, detailed. For the first time, I am not discouraged while consulting instructions for use. Pizzicato Pro has its cost but the investment is useful. And I find great the fact that your share your musical knowledge with your customers. Thank you for the incredible software of Pizzicato Professional! I've written a lot of music since the age of seven, starting with the violin, then guitar and now piano. I've always had to have someone do the notation for me. I've written a number of full musicals this way. Now at the age of 52, with Pizzicato Professional, I have the capability to not only do the notation myself but also the initial arrangements. I bought the electronic download about a month ago, the most current version, and I am in heaven! You may be interested to know that I am using Pizzicato for an international project. Children from the school on Tristan da Cunha have sent their poems for my own pupils here in England to set to music. The resultant songs have gone back to the island as Pizzicato files, and are now being sung there! Using the same Pizzicato files, I am now creating a book of these songs and this will be sold both here and on Tristan. I'm really pleased I can now dowhat I was struggling to do yesterday! Cheers. "Pizzicato beginner is just excellent for helping me to practice my part in the choir." Thank you so much for your continued efforts. "It is fabulous that you could help me so quick when other scores programs makers never answer. Thank you again !" "I have just received and used your music software for the first time, I am not an expert in writing music but I found very easy to use and think this is an excellent product." I use your software for my worship ministry (choir) and I adapted a "Allelujah" which was composed by the son of our organist. The result is very good and moreover can be listened on the computer. I recommend your software to the musicians that I know. "Thank you so much for the Musical Newsletters ....current and archived. They bring so much more information and pleasure to the exploration of music and are the perfect partner for the excellent software." "Congratulations! You seem to have combined the best of several of these softwares into your Pizzicato. I´m amazed, editing wav-file on sample-level ! I have used a software to "mess up" my pieces - to make them sound more human, drawing velocity-curves, drawing tempoadjustments like rubatos etc. The ability to store musical ideas in a directory and then be able to adopt them rythmically and harmonically - I will be able to shave a lot of time used for tideous tasks like these... I´m very impressed with what You have achieved and as soon as I can, I´ll buy my registred version. In the meantime I´m further studying what Your software can do. Truly amazing !" "The main feature that made me decide in favour of Piccicato is the fact that while you put the notes on the score, you can hear them as well. 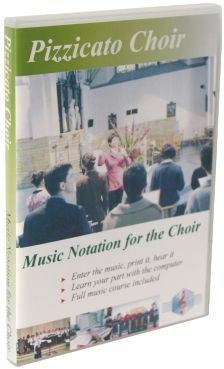 This helps me very much to get familiar with the notes and their sounds and produce nice and correct harmonic results. In general, its editing capacities are very good. But, beside these features, I saw a serious and constructive effort in general. Some other softwares are too expensive for me and, for the time being at least, do not offer something that I cannot find in Pizzicato. Further, I tried also Noeteworthy composer, but its sound was rather poor. In total, I tried for more than 2 months to end up with a software that covers my needs. And its price is more than affordable." "I sometimes create songs with lyrics scores for an amateur theater ensemble in my village. I must teach the songs to the actors and at the beginning we have no scores. I also must do accompaniments. I used another software before, but it could not associate notes and text, and the page layout was rigid. I can do that with Pizzicato and it works easily. I also use Pizzicato to transcribe piano pieces with all the different existing symbols or to compose little personal pieces. I also saw that Pizzicato has more features than another well-known software which is three times more expensive. At Pizzicato you get a perfect service when you have questions (and I had a lot), a very complete manual and a lot of other advantages, as help to composition, music course and libraries. You can also adapt the format, the fonts and the tools. 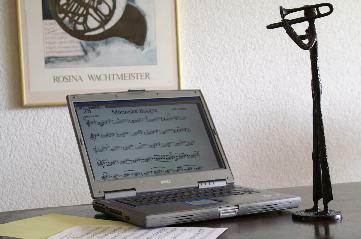 As a conclusion, it is the best music notation software for the cheapest price on the market. I wish you a lot of success with Pizzicato." 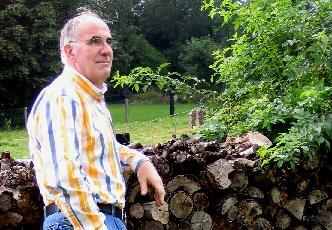 Dirk Bonjean (Belgium) - Amateur pianist, independant electrician, near retirement. - for the piano, I will soon use the SharpEye scanning software, to memorize some rhythms more simply. Congratulations for the quality of your software." Jean-Claude Evenepoel (Grez-Doiceau, Belgium) - Pianist and chorist. "Congratulations and thanks for giving us a very good working tool which has already been of great help to me and will continue to be, I am sure. Most interesting is to be able to directly communicate with the publisher of Pizzicato." "Congratulations for the new version of Pizzicato. I really enjoy working again with this new version." "I am very satisfied with your Pizzicato software. Many achievements were possible thanks to its flexibility and its simple, effective logics." "Just whant to say thanks for the step by step course. Very good exercises and you explain exact and its easy to understand." "You let me remember the joys of the discovery that human being feels as a child." I find that you do an extraordinary work, I feel a real musical passion in it and I like that. The way of representing the percussions on this software is very interesting ! Congratulations about the quality of your software. The new interface is more functional (and I can judge because I am a designer). The composition aspects of the program interest me a lot. I cannot use money to thank you otherwise you would not have the satisfaction of the patient work made with a good heart, but I know somebody (God, the Creator of the sky and the ground) who can return the centuple of your professionalism. This one joint with my perseverance produces the so much desired result. Your software is interesting and very accessible! I do not regret this purchase! Taken by time I did not have time to finish all the handbook but I quickly wrote my first little score with success. I greatly appreciate your quick reply! Your products have been checked by more than 40 antivirus tools and they are safe. I think Pizzicato is a fantastic software that has all the combined features of F..., E... and even C... and l am planning to purchase the software sometimes in the near future. Your software is amazing and can do a lot of things connected to a MIDI keyboard. Not only in matter of composition but also in harmonization. I thank you for the coupons in the framework of your education program .One of my members is already in possession of your professional version and it of it is very satisfied. I worked up to 2 A.M. with my new program and I composed and printed a tango in two hours of time. I will be able to present another impeccable score at our chorus-singers. It is brilliant! I had already acquired version 2 a few years ago and had been rather satisfied. I discovered the new version which is a very beautiful evolution. My needs are those of a choir director who does not have much time to make the training of the scores because some chorists do not memorize them easily. I was searching to record separated voices without spending too much time. With the graphic mode it is much faster. It is not the first time that I am pleased to have chosen your product more than 10 years ago. If all the providers could work as you it would be a real pleasure for us the users. Congratulations. "You are the best company I have worked with." "I would like to express my appreciation for your very informative email. They are a joy to receive and keep each one to read and read again. Please don't stop sending them." "I have much pleasure in legibly copying scores for our choir." "Indeed, I use this program more and more and I find that it is terribly well done! It should be said that since its purchase, I have enjoyed this software very much, both for its easy use and for its advanced functions. Well done for the follow-up and the evolution of this excellent software." "This program already allowed me to compose and transcribe a large number of pieces, and I think it is very complete and well conceived. I have been a Pizzicato user for three years now. Each day I discover new functions of the program and I control it better and better. It already helped me for many transcriptions and personal compositions, so I can only say to you: thank you." "During the holidays of July 1999, when I had just retired, I studied the software and I was immediately enthusiastic about it." "Pizzicato was already fantastic, so how will be Pizzicato 2 ? You rarely see a software designed with such a care, I congratulate you and I look forward to receiveing this new version." "The Pizzicato software surprised me both by its easy use and the power of its functions." "I am extremely satisfied with your software which is really powerful. Your manual is very well designed, even for ignorant about computers like me. Indeed, up to now I had never had the opportunity to touch a computer." "Congratulations for the quality and the presentation of your wonderful product. I am very satisfied to have chosen Pizzicato. Never did I receive such a fast response with a clear and full explanation." "I find Pizzicato as user-friendly to use and manage than my multimedia PC. In short, a considerably precise work enabling an always growing recreation. It is a beautiful success. The problem: my wife has an additional rival at home." "Congratulations for the presentation and the very practical manual. It is a remarkable work." "We bought Pizzicato a few time ago. We are satisfied with your program and we recommend it to other monastic communities. Thank you for the services this program provides us with." "Since a few weeks, I possess Pizzicato version 2 and I am very satisfied with it. I have better appreciated to work with Pizzicato since the change of environment." "Thanks again for the update of Pizzicato: it is really pleasant to work this way! To manufacture that, it was necessary to think of so many details...! Page layout is also well simplified!" "Congratulations for the new version of your software. Its alignment to the usual functions of Windows simplifies its use a lot." "In the field of composition, the range of software tools seems to me very reduced. Congratulation to have tried to fill this vacuum. Also for the documentation which is remarkable." "I use Pizzicato with much pleasure. Congratulations for your site and see you soon on the Internet." "I want to express my satisfaction regarding this program that brings me as well pleasure than facilities. I look forward to discovering version 2." "Knowing already Pizzicato Beginner - which I want to mention, is a well-designed program - I would like to update to the full version." "Wonderful site! I bought Pizzicato on the first day of its publishing. This program is as wonderful as unknown. I really hope this site will increase the Pizzicato user's community." "I thank you for the assistance you bring to musicians and other music lovers by the way of a complete and instructive program." "I personally want to congratulate you for the beautiful program you conceived, namely Pizzicato. It directly appealed to me by its simplicity of use and its possibilities." "Congratulations for Pizzicato. I have now a program to learn music and avoid the multimedia silliness like Learn music in the intergalactic spaceship of Dr musicos." "Finally, we encourage you to continue your research work. Globally, we are very pleased about this program and we find the user manual very well done." "Pizzicato is already a splendid companion, it can become it more. You have to estimate, but no well known has up to now really approached (or dared to approach...) composition. To you goes the merit of the originality in the design." "Globally, I am delighted by this program and I do not regret at all this purchase. The musicians for whom I write scores are also pleased." We thank the users for their congratulations and encouragements. 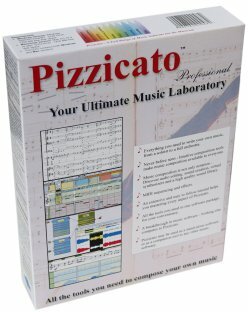 We engage ourselves to continue developing Pizzicato in the direction of an ideal computer assisted music software.